Some problems may not be picked up as they are mild or the child is so used to them that they don’t notice. There is evidence that these can be treated and that a proper screening programme will find these more subtle vision problems and refer for treatment. Without such a programme, they may go unnoticed and untreated. It is on that basis that the UK NSC recommends screening all 4 to 5 year old children using a standard test. Back in May I wrote about the work we're doing to develop a set of resources to support vision screening and why this is so important. The test will only pick up a problem with vision. It is important to know that it will not find infections, problems with the eyelids or with the retina (unless they interfere with the child’s ability to read a chart). Eye problems are common but serious ones are very rare. Six in 100 children have at least one eye problem in the first 3 years of life. But only 3 in 1,000 pre-school children have a problem with their vision (ref 1). It is thought that around 29,000 children in the UK have moderate or severely poor vision (ref 2). As they get older, 16 to 25 year olds in this group are twice as likely not to be in education, employment or training (ref 3). As most severe problems will have already been picked up, the test is most likely to find mild problems. These are likely to be short or long sight, amblyopia (lazy eye) or a mild squint or strabismus. This is where the muscles of the eyes don’t work together as they should and on occasions the eyes don’t look in the same direction. Research suggests that amblyopia is the most likely reason for these mild vision problems (ref 5). When a child is found to have a problem on the screening test they will be referred to a specialist eye service for further tests and treatment. There is treatment for each of these conditions. Glasses or patching are the most commonly used. Screening identified that Cameron was very long-sighted and had a lazy eye. 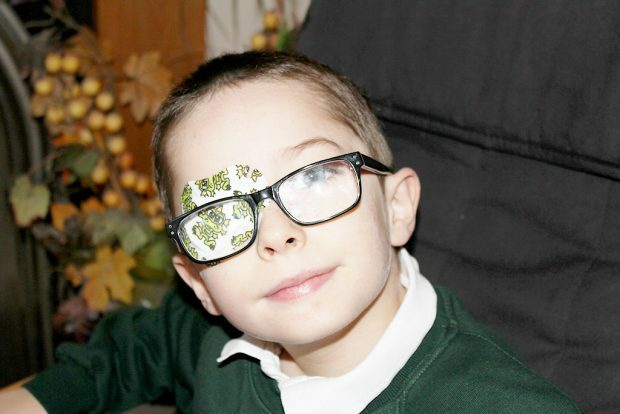 A combination of patching and glasses has had a huge impact on his ability at school. It is very important that the child is seen by a person trained to do the screening tests and part of the formal screening programme. Many people get their (and their children’s) eyes tested as a routine. Parents should check that these services are part of the programme so they can be sure they meet the strict criteria we use to assure quality of the information and the test and referral. We recently had a meeting of the expert group where early drafts of the documents were discussed. We are continuing to develop these. We hope we will be ready for people to comment on during December and January. We will write another blog when the consultation period opens. Please let us know (psassistant@rcophth.ac.uk) if you would be interested in commenting and we will send you a copy. If you’re interested, here are the sources of evidence for the statistics in this blog. Hi I understand the responsibility sits with LA commissioning as part of the 0-19 healthy child programme, however as evidence suggests and the NSC recommend that this should be a national screening programme I do not understand why this is not part of the national screening responsibilities of NHS England. From the information provided above you state the majority of vision impairments are detected by parents and Teachers, therefore my question would be why you would then recommend a universal screening programme. What is the proportion of children picked up that would have been missed? would awareness raising with parents to take children to opticians, and a referral programme into targeted careening for those parents/teachers concerned be just as affective? with increasing pressure on Local Authorities and public health funding reducing it is difficult to protect such programmes when its a recommendation and not mandated function. I therefore would suggest it would also be helpful for commissioners to provide tools and advice for a targeted programme where a universal programme can't be offered. <a href="https://www.england.nhs.uk/commissioning/pub-hlth-res/">The public health functions agreement (Section 7A)</a> is an annual agreement between the Secretary of State for Health and NHS England that covers the screening programmes commissioned nationally. The decision about what is covered lies with the Department of Health. The explanation about why a screening programme is recommended and what numbers are picked up can be found in the full <a href="https://legacyscreening.phe.org.uk/vision-child">UK National Screening Committee review</a>. Public Health England has committed to developing guidance to help local authorities provide a whole population screening programme. The UK NSC does not produce evidence or guidelines for high risk or targeted testing programmes. That would be a task for the National Institute for Health and Care Excellence (NICE) or other bodies that develop guidelines such as the royal colleges. Amblyopia is not a "mild problem". An undetected and untreated amblyopia can lead to permanent loss of vision in one eye. If an untreated adult then lost their better eye, or more importantly an elderly person develops macular degeneration 70 years later, they would be registerable as blind, with subsequent many years of dependance on state services. If the NHS is to make best use of its resources, it is vital that all children are screened, rather than a selected few going for a full eye test - the upshot of relying on parents taking their children to the optician is that is that the children who should be detected may well be missed (because they are more liklet to come from families unlikley to take them), while excessive NHS funding would go for full testing of many thousands of children when a quick screening is more appropriate. Dear Anna, thank you for getting in touch. You make an important point. The purpose of using terms like mild is to get over to the reader that these are problems which the parent or child might miss themselves. You are right that if a person has poor or no sight in one eye then the loss of sight in the other is very serious. The <a href="http://legacy.screening.nhs.uk/vision-child">UK NSC review</a> (link) addresses that and estimates that the chances of that happening are just over 1% (one in every 100 children with amblyopia will go blind in their lifetime). Someone with amblyopia is 2 to 3 times more likely to become blind during their lifetime than someone without amblyopia. The aim of the vision screening guidelines development advisory group is to give advice and tools to enable the complex screening, referral and treatment pathways to be commissioned and delivered to consistent and excellent standards. Thank you for your comment. You have to ask why, if the evidence for such a programme is so strong, NHS England does not commission this service consistently across the country in the same way that it commissions other screening programmes. Thanks Tim. Screening for vision and hearing problems in 4 to 5 years olds is part of the local authority commissioned healthy child programme and has been since 2013. The strength of evidence is not and should not be a key driver of who commissions it.